This salad combines the goodness of Tofu along with fresh crunchy veggies. Adding Rice Vinegar with Soy dressing made a magic with its unique tangy taste. The nutty taste was added to the Salad by Sesame seeds. In a bowl add in all the ingredients and lightly stir. Cut cucumber into ribbons using potato peelers. Cut the tofu into pieces of a baby finger size. Cut the cherry tomatoes to half. Place a tofu on a cucumber ribbon and roll up the ribbon, repeat with remaining. Place pieces of onion on cucumber rolls. Place cherry tomato slices and finally drizzle some dressing and serve. Bell peppers, leafy greens, lettuce can also be included while serving. Posted on September 16, 2014, in Salad/Wraps, Vegan. Bookmark the permalink. 38 Comments. Tofu is a favorite of mine. Loved the way you have dressed it Chitra with cucumber 🙂 very nice….. Delicious fresh salad. So Pretty Chitra! the ribbon idea is innovative!! 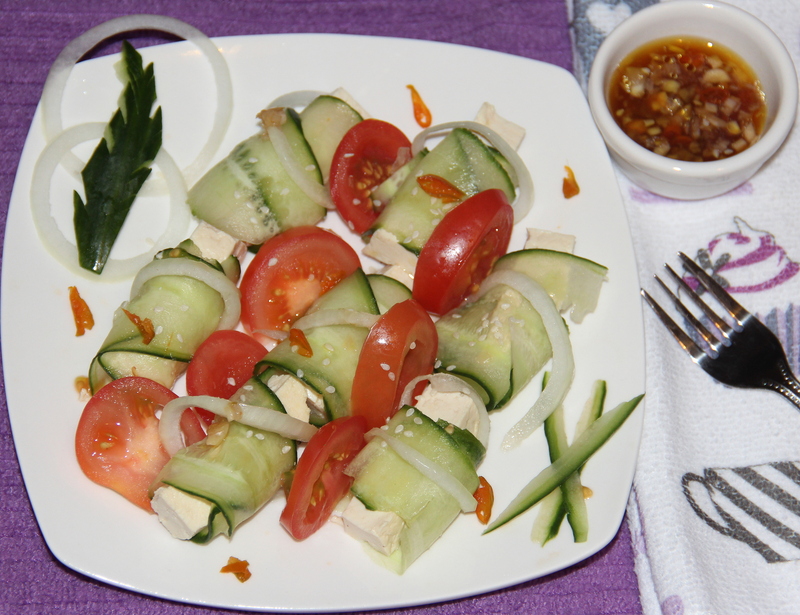 Thank you Chitra for this healthy, tastyand super easy preparation 🙂 I was amazed to to know how creatively you prepared those cucumber ribbons! Awesome idea! Thank you Sindhu for such lovely and encouraging comment, am blessed to have such wonderful friends around…have a lovely day dear… tc..